We have received an internal screen shot of what appears to be a Fido iPhone 4 product page that features the white iPhone 4. With all of the white iPhone 4 rumors floating around, is Fido set to launch the mystical white device? The screenshot below reveals the Fido designations for the white iPhone 4 models in 16/32 GB, alongside the black iPhone 4. 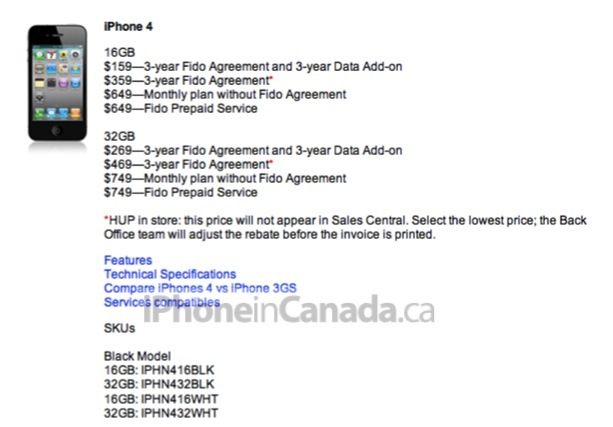 It is odd however that the white iPhone 4 is listed under the “Black Model” title, so Fido may just be in the early stages of preparation. While this does not guarantee a release of the device, we know that the white iPhone 4 is expected very soon, as various rumors, and Apple themselves, have confirmed the white iPhone 4 coming this spring. If you’re on Fido, have you been waiting for the white iPhone 4?